In a weekend of fast racing at the Winter Cup Invitational in Calgary, the 17 swimmers that represented the Riptides had an impressive haul of 32 medals and many personal best times. Alex and Emiko went undefeated in all of their races winning 6 gold medals each. Emiko grabbed 3 new A times and smashed the 100 back club record by 2 seconds taking down Sarah Mackay’s long standing 2005 record. She also led the 11-12 girls team of Cassidy, Avi and Aydan to second in the 200 free relay and joined Emily, Cassidy and Avi for another second place finish in the 200 medley relay. Sean dominated the 14-15 age group with 5 gold and 1 silver and led the relay team to a third place finish in the 200 free relay. Other medalists: Domenic with 1 gold, 3 silver and a bronze; Jeremy with one gold, a silver and a bronze; Avi with 2 silver and a bronze; Avery with 1 gold and a bronze; and Emily with a bronze. The relay team of Maja, Avery, Joanna and Marin took second in the 13-14 200 medley relay and the team of Maja, Emily, Avery and Marin came fourth in the 13-14 200 free relay. Anthony, Jeremy, Domenic and Leighton took second in the boys 11&U 200 medley relay and 5th in the 200 free relay. Next up for the club is J.P. Fiset in Edmonton, a massive 4 day meet with heats and finals and featuring some of the fastest swimmers from Western Canada and the Territories. 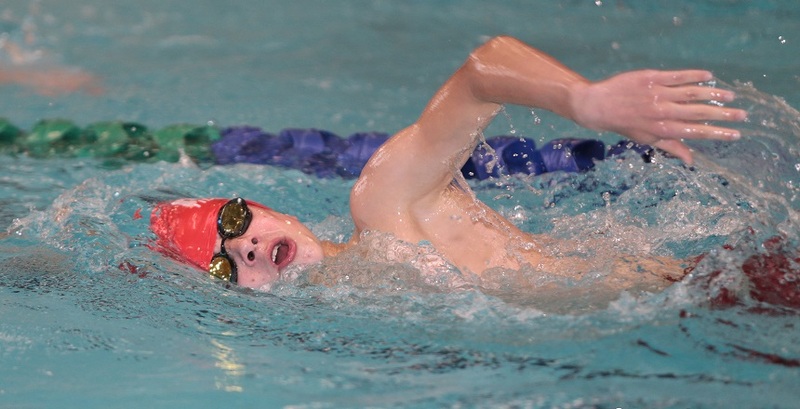 This entry was posted in Meet Results and tagged Medals, Records, Swim Meet by bowvalleyriptides. Bookmark the permalink.